Sometimes overlooked, clinicians also need places to feel well in. A carefully designed environment is needed to foster an optimal and productive work environment. Blue is known as a calming, stable and intellectual color. Used in areas where caregiver communication is important as it creates less distraction, allowing for focus and productivity. Purple is often connected to luxury and spirituality. It should be used sparingly as too much purple could have the opposite effect on the caregiver, diminishing their spirit. Red is known as a physical, exciting and strong color. It’s good to use in areas where a lot of action takes place such as physical therapy. You’ll keep the momentum up between the caregiver and patient. On the topic of red, use blue and green colors in operating rooms for surgeons as these colors will neutralize the after-image of red (blood). Green and other nature-inspired colors and textures such as woodgrains create a sense of calm and reassurance. This is particularly helpful if you feel overwhelmed by all the tasks you need to complete. It’s a good color for caregivers who are known to work long hours, as it doesn’t cause eye fatigue. Bottom line: If you want happier, more effective workers, green, blue and other nature-inspired colors and textures such as woodgrains are ideal. If an environment is designed to support caregiver’s well-being, productivity, and satisfaction, those benefits will then trickle down to their patients. Altus designs and develops custom technology workstations in the healthcare environment with a modern approach to colors. 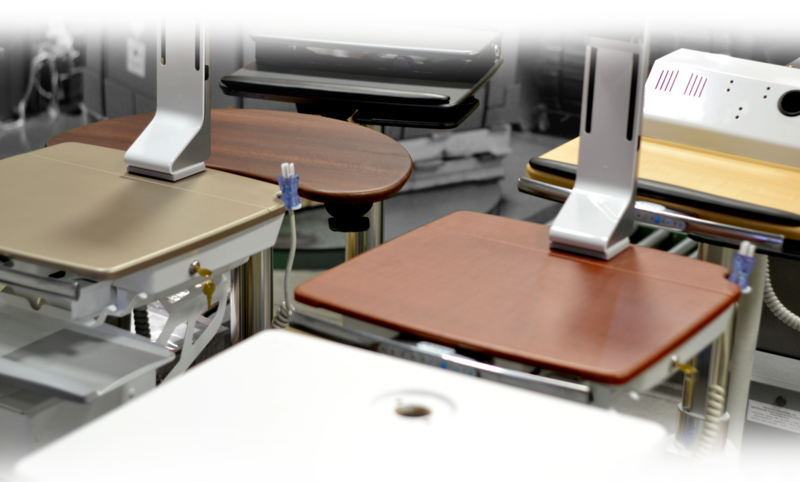 Manufactured with fine detail in the USA, Altus' carts are known to enhance patient and clinician satisfaction and productivity.